In housing, generations intersect regularly. Who's downsizing? Who's driving the market? Who's trading up? "REALTORS® throughout the country have noticed both the notable upturn in buyer interest from young adults over the past year, as well as mounting frustration once they begin actively searching for a home to buy," says Lawrence Yun, chief economist at NAR, of the study. "Prices keep rising for the limited number of listings on the market they can afford, which is creating stark competition, speedy price growth and the need to save more in order to buy. These challenging market conditions have caused—and will continue to cause—many aspiring millennial buyers to continue renting unless more Gen Xers decide to sell, and entry-level home construction picks up significantly." Millennials are buying homes with higher values, but the same square footage: $220,000 for 1,800 square feet, versus last year's $205,000 for the same size, reveals the study. They are close to family and friends, as well, and prefer to reside near them—an attribute in common with other generations. "The sense of community and wanting friends and family nearby is a major factor for many homebuyers of all ages," Yun says. 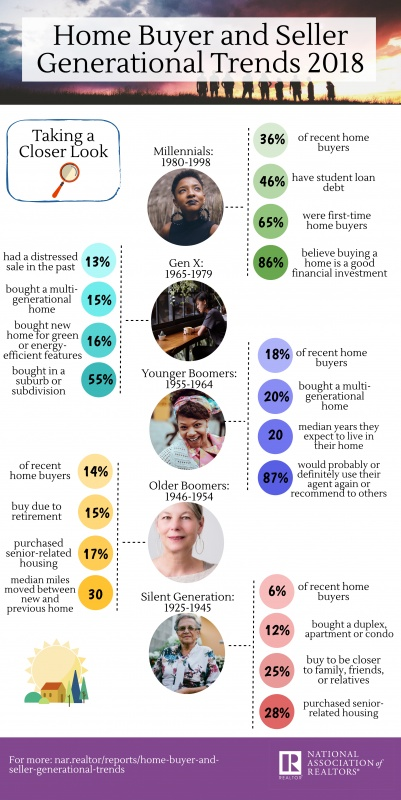 "Similar to Gen X buyers who have their parents living at home, millennial buyers with kids may seek the convenience of having family nearby to help raise their family." "While there is an overall trend among households young and old to migrate towards urban areas, the very low production of new condos means there are few affordable options for buyers, especially millennials," says Yun. "Especially in today's fast-moving housing market, consumers of all ages want a REALTOR® to guide them through the exhilarating, yet nerve-wracking experience of buying or selling a home," says NAR President Elizabeth Mendenhall.